Ethel Mae Adkins, 72, of Middle River, passed away at her home on November 26, 2018. She was born in Baltimore to the late Howard William and Babe Louise McCauley. She was a member of The Fellowship of Pentecostal Churches Inc. and enjoyed spending time with her family. 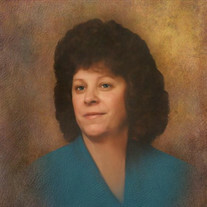 In addition to her parents, she was preceded in death by her sons, William H. Adkins II and Leonard N. Adkins Jr.; and her siblings, Howard Jr., Mary, Bernie and Barbara. Ethel is survived by her devoted husband of 56 years, Leonard N. Adkins Sr.; loving daughter, Eunice Adkins; cherished grandchildren, Angela, Ashley, William, Destiny, Jennifer and Alexis; five beloved great-grandchildren; and dear siblings, Jean, Lois, Andrew, Wilma and Michael. The family will receive visitors at Singleton Funeral & Cremation Services, P.A., 1 2nd Avenue S.W., Glen Burnie, on Thursday, Nov. 29th, from 3-5 & 7-9 PM. A Celebration of Life service will be held on Friday, 1 PM, in the funeral home chapel. Interment Glen Haven Memorial Park.